How do air sacs in the lungs work? How do air sacs in the lungs help with gas exchange? Your lungs are not just like balloons. They are filled with millions of tiny air spaces called alveoli, which are the air sacs you mentioned. The reason the lungs don't just have one big balloon, but instead contain millions of tiny balloons, is that each balloon has to have a wall. In the wall of each balloon are tiny capillaries, which are very thin-walled blood vessels. The blood from your heart gets pumped through your lungs, around the walls of these tiny air sacs first, and then back to the heart before it gets jetted off around the rest of the body. As the blood flows through these tiny blood vessels around the air sacs or alveoli, it exchanges carbon dioxide, which is dissolved in the blood, which gets chucked out of the blood because there's more in the blood than there is in the air sac. And oxygen, which there's lots of in the air sac, comes out of the alveolus and into the blood. It forms a compound with the haemoglobin which is the stuff that makes your blood red, and gets carried away. The average red blood cell takes about 0.3 seconds to pick up all the oxygen it can from the wall of the alviolus but it spends 0.8 seconds actually making that journey. So the red blood cell has nearly three times the time it needs to pick up all the gas it needs. So that's how the gas exchange occurs and why you don't just have one balloon in your chest but millions of tiny balloons. It gives your lungs the surface area of about a tennis court if you were to spread them all out. 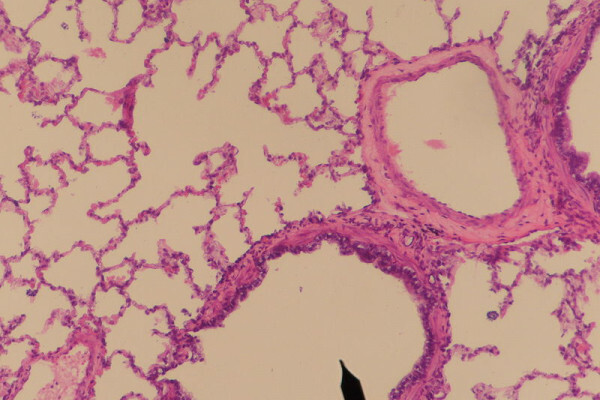 And this means that there is a large surface area of lung tissue and blood vessels in contact with the gases to enable efficient gas exchange. Previous Can you reflect x-rays or radio waves? Next Can we split water?